Virtual Radar Server's installer copies all of the site's files to <Program Files>\VirtualRadar\Web. When the server is compiled it checksums all of these files. When a browser asks for one of the files the server checksums the file and compares it with the checksum created at compile time. If the checksums do not match then it will not serve the file. This means that you cannot change the site's files by just editing the files under Web. However you can use the Custom Content plugin to tell the server to look in a folder of your choosing for files to serve. When a request for a file comes in the server will check in your folder for the file before it looks for it in the Web folder. If it finds the file in your folder then it will serve it without testing any checksums. Overriding files is the least future-proof method of customising the site. It is likely that any modifications to the files you override will need to be reapplied when you install a new version of Virtual Radar Server. Create the folder that will contain your custom files. Do not put it under the VirtualRadar program folder - the installer could erase it. 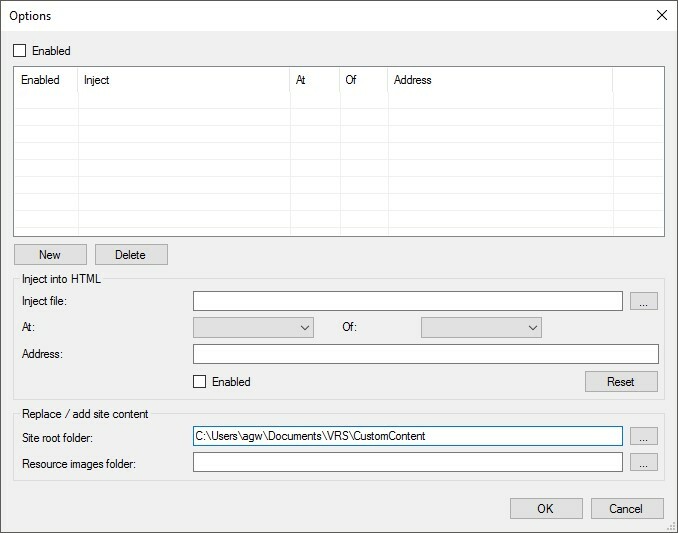 The site root folder and HTML injection options can both be used together, they are not mutually exclusive. If you add HTML to the site then that HTML can have content injected into it. Bear in mind that anything in your custom site root folder can be served to a browser. Do not put private files into the folder or any sub-folder of that folder. You do not need to copy all of the standard files into your folder. You only need to have new or modified files in your folder. If the server does not find the file it's looking for in your folder then it will serve the standard file instead. You will need to keep the same folder structure as the one that exists in Web. For example, if you wanted to completely rewrite the CSS for the site then you would need to put your version of vrs-common.css into a sub-folder called css underneath your alternate site-root folder.